A conversation with the poet Max Ritvo about friendship and cancer. A conversation with Max Ritvo. 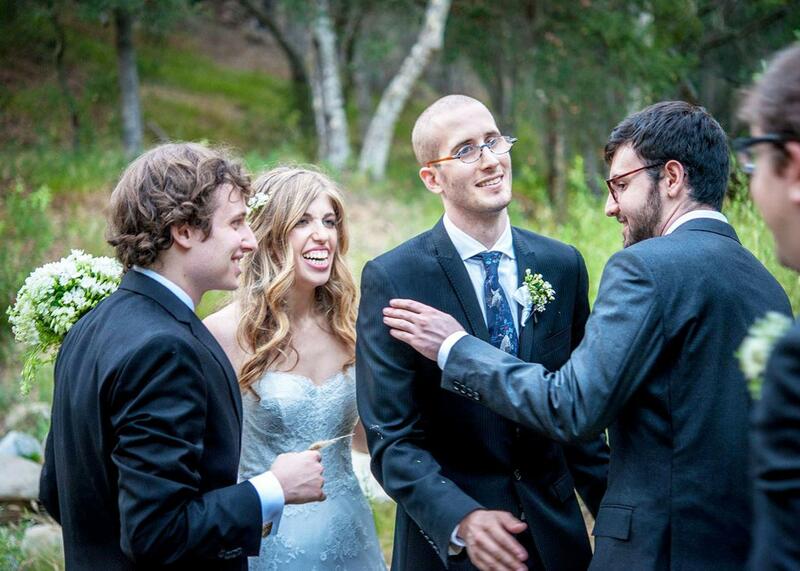 Shon Arieh-Lerer, Victoria Ritvo, Max Ritvo, and Andrew Kahn at Max and Victoria’s wedding on Aug. 1, 2015. Our best friend Max Ritvo died on Aug. 23. He was a poet whose work appeared in the New Yorker, Poetry, and the Boston Review. Max was diagnosed with Ewing’s sarcoma at the age of 16, and again at 21, about a year after we met him in college. We performed with him in our comedy troupe His Majesty, the Baby; edited each other’s poems and term papers; and ghostwrote each other’s texts to our crushes and parents. Max’s poems are intimate and exuberant. They speak directly to the reader’s body. We talked with him on July 13 and 14 in his bedroom in Los Angeles, focusing on one poem, “Universe Where We Weren’t Artists.” The poem is about our friendship and ends his first book, Four Reincarnations, which was published this week. Max’s wife, Victoria, was present for one of our sessions; for some of the time he was doing exercises with a physical therapist. He was in pain, but he was accustomed to being in pain. The conversation has been edited and condensed for clarity. Max Ritvo: There’s going to be loose ends, at any point, for anyone speaking, for anyone existing, and that’s fine. It doesn’t really matter how old you are. The present tense presents you with feelings of irresolution, and the future tense, if you let it, will, too, fathomlessly, for all time. I’m glad that I don’t have to figure out the meaning of life. There are a lot of things that I was worried about when I was younger—like, I’ve gotta figure out my relationship to privilege perfectly, I need to figure out how to live a life that’s balanced and ethical, I need to be totally autonomous and independent. And I didn’t get there, and it’s fine. In this interview I don’t expect us to do anything other than what we do every time we speak. I’m less and less interested in intellectual athleticism and lifting heavy weights. I’m not Atlas. In the end, what Kazuo Ohno did was finger dances. You get a lot done with your fingers. Reprinted with permission of the Poetry Society of America. Max: I wanted to write a poem in which I felt the most fundamental loss of all. And the most radical, the most extreme, the saddest universe I could envision was the universe in which we persist, but we aren’t artists. It’s you guys giving me comfort in the saddest of all possible worlds. This last stanza to me is one of the most tender I’ve ever written. It’s what I want at the end. My breath is getting ragged as I talk to you guys, right now, and there will come a time where the raggedness is lethal, but if you tickle me, it’ll be lethally funny. It’ll be unclear whether the last thing that comes in is a note of pleasure or a note of agony. That’s what I wanted the book, as a whole, to end on. It’s what you guys have taught me—that I get to have a confused end. And that having a confused end, that’s the complete end. Andrew Kahn: Your poems do seem to embrace states other than perceptual clarity: anger, confusion, compassion. Max: I haven’t really departed from writing poetry for the reasons I did when I was 12 or 13. At that point I was very angsty and confused. I had a lot going on internally and writing was a space where I wasn’t really asked to resolve it or figure it out but to crystallize it. I’ve been in therapy a very long time and the kind of therapy I was in wasn’t really interested in changing me. It was interested in getting me to have “insight.” There’s something kind of horrifying about a life model that teaches you that all you gotta do is get it. You don’t need to try to be a better person, really: That’s all going to come along secondarily. Your job is to get it so articulately that your psychosis becomes part of your speaking apparatus. Andrew: The images in this poem are different than the images in your other poems. They’re haiku images, in a way, to the point that some of them are freestanding nouns, the way in a Zen haiku you’ll have freestanding nouns. Andrew: The space in it, mentally, is very different. I find that there are big cognitive leaps between the stanzas. I feel like each stanza is like a little stone placed on a grid, and then far away, there’s another stone somewhere. Shon: It’s very dreamlike. A lot of what goes on in dreams is how you think during the dream. My experience is that those dream thoughts also control what physically happens in dreams. But this is different—this poem is like the visual percepts of a dream without any of that mental stuff. Andrew: Do you see yourself as shooting yourself in the poem? Max: No. Just looking. And then air knocking me over. Shon: —and knocking us over. The whole thing is about inversions. Inverting the gun seems to represent how we invert our thoughts in order to examine the act of thinking itself. We look deep into our minds and bodies, and then that’s what creates the outside world. Andrew: I see it as shooting oneself with a blank cartridge. Shon: That’s how I originally saw it. Max: And then we look up to something. It’s the moon, it’s hilarious. It’s everything we worship. It’s how silly a cocked gun is, how silly whatever we’re doing is. That’s what we look up to at the end of the day. And that’s not what proper hunters venerate. Shon: This reminds me of the Zen aphorism “the finger pointing to the moon is not the moon.” Here, our guns are like the finger—but we’re pointing the guns at ourselves, not the moon. Then by examining ourselves—looking into the scope—we’re suddenly knocked on our backs, and we’re looking straight at the moon. No more fingers, no more guns. It’s kind of like a Zen moment of sudden enlightenment. Max: Yeah, exactly. It’s so much realer of a moon than when the finger is telling you to look at the moon. But in the end, I fall down, because it’s hard doing all this. It’s hard enough being an artist, it’s even harder being in a universe with your loves, who are artists, and not being an artist. Which I think we’ve all been forced to do at times. Andrew: Yesterday you had an angry exchange with somebody on the phone. You were in a state of discursive hyper-clarity and lucidity: This is exactly what I’m thinking, I’m going from Point A to Point B. It’s a state that I’m familiar with, too. Does that state enter into your work? Max: I think it’s a newer mode to my anger repertoire. My anger repertoire used to be: Look at how demented I can get. If you push me, you’re going to produce an image-making faculty unlike anything you’ve ever seen. You’re going to get the kind of curses you get in Ezekiel. The newer mode is some of my nastier elements merging with my mentor Louise Glück, who taught me that if you really want to cut somebody, keep your logic as sharp as an obsidian knife. That’s going to be able to cut way deeper than chainsaw. Shon: You do the same thing in play, in comedy, and in conversation. Sometimes you build a universe out of a single detail, giving that detail friends and company: images and what-ifs and mixed metaphors. But when you’re in a lot of pain, you don’t always have the energy, patience, or will to build worlds, and then you just want to say truth and that’s it. That’s also a form of play. Some people would call it truth-seeking, but that’s not the point. The point is to stab with that obsidian knife, not to kill the thing you’ve stabbed. Max: I think Louise has an essay where she says there are two different voices when you write good poetry. One is: Look at all the stuff I have to say to you. Isn’t that neat? The other voice grabs you by the throat and says, You really need to hear this right now. The first voice is what gets me up and going: flashes of purple and science fiction and robots. That’s a general firing impulse. But as I get sicker, I’m more and more drawn to that second voice. I think part of that is me maturing as a writer. I think the older I’ve gotten the more interested I’ve been in little electric whips of truth as—they make me laugh more. Shon: So why are we hunters? Max: We’re seekers. As much as we like to pretend we’re in it for the journey, we’d actually like to create the final piece of art, a perfect piece of art, to have that ecstatic communion—which we know doesn’t really exist. But there’s still that urge. It doesn’t make any sense for us to hunt anything in the outside world because we’re nonviolent. So we take our guns and flip them upside down, like Elmer Fudd. We’re looking in the barrel and there’s a telescope lens in there. I almost put “inept hunters.” There’s no such thing as a sweet hunter, especially not to a vegan. Shon: That’s the main thing that confused me. Why would I ever be a hunter? Andrew: I was also projecting certain anxieties onto the poem. There have been moments—when we were getting to know each other—even after we were getting to know each other—where one of us felt that the other was judging them. These moments were almost always miscommunications of some sort. But they were extraordinarily painful. And I was afraid that in depicting me as a hunter you were suggesting that I was in some way an aggressive or adversarial person. Max: I’ve never felt … I’ve felt, Andrew, sometimes, like I’m letting you down. And that’s been very hard on me. But I’ve grown stronger over the past year or two. And in that time I think you’ve grown stronger, too. And those feelings have really been secondary or tertiary to me. I didn’t know this poem had hurt you guys. I saw it as a very pure expression of the greatest gift I could give you, to tell you that when my life is meaningless you give it meaning. Do you remember what was happening when I wrote it? I was getting terminal scans for the first time. Aggression towards you was not in my mind at all. What was in my mind was: This is now me being told I’m dying. Andrew: I’m getting very emotional. Max: You guys will bury me. Now look at where we are. Do you want to get up in there and start tickling? Max: That would be so funny. (To his wife Victoria:) How mad would you be? Shon: You’d come around. That would be such a great death. Victoria: No, don’t do it! When we’re all sitting around your deathbed, we’ll tickle you, OK? Four Reincarnations by Max Ritvo. Milkweed Editions.